BEP Marine’s new heavy duty fuse holders are an economical way of fusing heavy loads 30-80 amps. Ideal for battery charger outputs or mains feeds. 6mm (1/4”) studs receive ring terminals and cables up to 25mm2(4 gauge). Fuse is clamped between tinned brass clamps for positive connection. Covers enclose exposed terminals to meet ABYC standards. 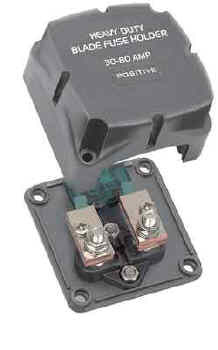 The 702-HDBFH fuse holder fits Maxi Type blade fuses.